This is a digital sketch that I made this morning using the Pocket Painter program on my handheld computer (PDA). I am about to start a series of paintings of the mill and river in Manchester, New Hampshire, and this is one of my ideas for a painting. 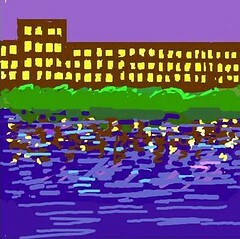 This is a night view of the mill and river, with the lighted windows reflected in the water. I have been thinking about this idea, which is roughly based on a view that I saw through a window on a recent trip to Manchester. I did take a photo of that view a few weeks ago, but didn't look at the photo today before I made the sketch. Instead, I worked from memory and imagination. (Tonight I found the photo to see how close I came; I will post it tomorrow.) Even though this sketch is rough and unfinished, it helped to work on it. Now I have a better idea of what I want the painting to look like because this is going to be the basic composition. Although I will make some changes, this is the basic color scheme. I am going to use oil bars for the painting, so of course it will look very different from this digital image. I don't really need to go further with this digital sketch, but I like it for its own sake, so I may return to it and finish it later on. For the past week, we have had summer weather here, and it has been warm enough for walks on the beach. 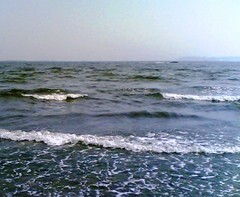 Here is a recent photo of the ocean on a very sunny day. 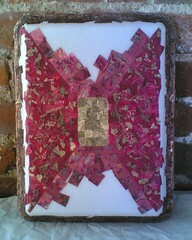 Here is a closer look at the collaged tray that I have been working on, using printed ribbons pasted over styrofoam. Yesterday I took this photo that shows the back and sides of the tray. I need to do some cleanup work, but this is basically the way I want the sides of the tray to look. I have been trying to finish this collage design, which is on the back of a tray. 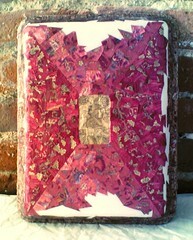 This is made of printed ribbon pasted over styrofoam, with a second collage on the front of the tray showing three roses in a vase. Today I went to Red Brick and finally completed the back, bringing the border all the way around the sides. Although there is some cleanup to do, all the surfaces are covered and the design is basically there. So this is the last time I will post this view of the tray (I can hear the cheers and the sighs of relief), but not so fast; tomorrow I am going to post a closeup of the border. I don't know if I would have started this project if I had known how long it would take or how hard it would be. But still, I am glad I did because I have never made anything quite like this before in terms of style and technique. Apart from the glue (acrylic medium), this is made entirely from discarded materials (styrofoam tray from the produce section of the grocery store and ribbons that a friend was giving away). Today, while I was out running errands, I noticed a display of mums in front of the grocery store. 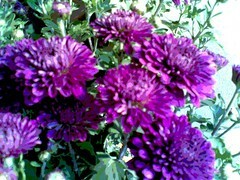 I especially liked the pink mums, so I took some pictures with my phonecam. The original version of this photo had the best composition, but the focus wasn't sharp enough. So I decided to open it in Painter IX. I tried sharpening the focus, but I didn't like the result. Instead, I posterized it, adjusting the levels till I had what I wanted. At the last minute, I noticed that part of a supermarket label, complete with bar code, was visible through the leaves. I could have just cropped it out of the image, but I really liked the composition as it was (just as it came out of the camera). So instead, I used some digital pastel to make the label disappear, and here is the result. 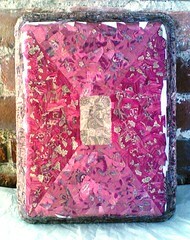 Yesterday I posted a photo of the collaged design that I am making on the back of a styrofoam tray. I also took a closeup view of the tray on its side. 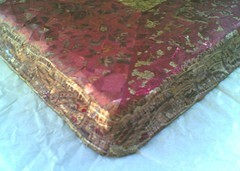 In this view, you can see the bronze pattern around the edges. I am using patterns to create the edges between the bronze pattern and the red and pink areas. I am not finished, but this view shows what I am trying to do. This morning I returned to Red Brick to try to finish this collage on the back of a styrofoam tray. (On the other side of the tray there is another collage of three roses in a vase). As you can see, I didn't quite succeed in finishing, although I did bring the design to the edges. Now I am working on the border around the side, but I am almost done. To be continued. . . .
On the drive home from New Hampshire last week, I was taking pictures with my phonecam from a moving car (from the passenger's seat, of course). The trip to and from Durham is beautiful, because you pass by and over several large lakes, and the light was amazing at dusk. Even viewing the original photo on my cell phone screen, I could see its potential right away, even though problems were apparent immediately as well. The trees were too dark and it was hard to distinguish the trees from the dark reflections in the water. But I liked the color and the patterns of light and dark in the water. So tonight I adjusted the light and dark areas, and then adjusted the saturation to restore the color. Then I cropped the image to get the composition that you see in the image posted here. On Friday morning, I went to Red Brick and worked on this design, which I am trying to finish up. It is a collage made of printed ribbons, on the back of a styrofoam tray (yes, from the produce section of the grocery store). The collage on the other side of the tray is already finished: a collage still life of three roses in a vase. Progress has been slow, but on Friday morning, I actually brought the red and pink designs to the edge of the tray in some places. I also started pasting in the pieces that will create the border between the bronze colored "frame" and the red and pink areas design on the back. Those transitional pieces will be geometric designs from the red paisley pattern for the red area, and leaves cut from the crewel design for the pink area. So far I have only pasted those pieces down in a few places, so it is very hard to see in this photo. But I hope to post a closeup view in a few days. To be continued. . . . Yesterday I took some photos of the white blossoms on the vines covering the chain-link fence. These blooms last into September, and although they are hard to photograph, I thought they would show up well against the dark green foliage of the trees. I was concentrating on the flowers while I was taking the photographs, but I did notice the morning sun in the background. 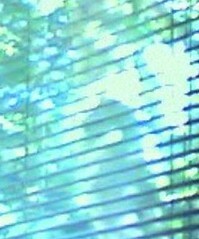 Later, as I began to work with the image, I became more interested in the sunrise and the sunlight through the trees. In the original photo, there were already some pink highlights in the sky and through the leaves. 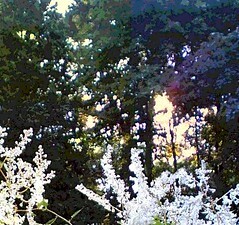 But the light in the sky was reading as white in the photo, making it hard to tell the flowers from the sky. So I opened the image in Painter IX and used some gentle pink and yellow color overlays in selected areas. I also cropped and posterized the photo to get the image that you see here. I took this photo on a recent walk near a wooded area. 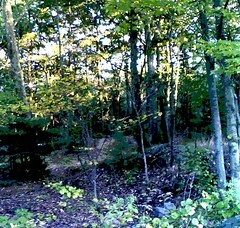 I liked the way the afternoon sun was hitting the leaves, so I tried to capture that with my phonecam. Tonight I opened the image in Painter IX and posterized it, then cropped it to get this composition. 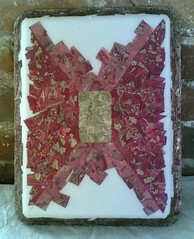 This morning I went to Red Brick to work on finishing up this collaged design on the back of a styrofoam tray. I already finished the other side, a collage of three roses in a vase. I am using ribbons printed with a variety of patterns. Today I worked on the red areas, coming almost to the edge. Then I decided that I had better figure out how I want to handle the border between the red area and the bronze areas around the sides. I decided to use pieces of ribbon that have both red background and a linear bronze pattern, and paste those pieces around the perimeter of the back. I tried this idea out in one small area, and I liked it. I will also do something similar where the pink pattern meets the bronze border, but I am not sure exactly how I will do it. Meanwhile, I added ribbon to the pink areas, and that went fairly quickly because I have a lot of pink ribbon on hand. But it is still takes time because I am careful about the placement of each piece of ribbon. To be continued. . . .
On a recent weekend walk in the garden at Long Hill, I saw some pink sedum blooming. I wasn't sure of the name of this flower, so I looked it up. It is officially sedum spectabile but is also known as "Autumn Joy". That's a fitting name because it is so nice to see these muted pink flowers blooming in September. 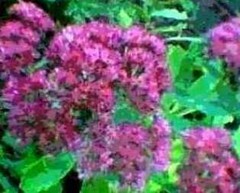 This image is from a photo of pink sedum that I took a few years ago, using my old phonecam that took nice, soft images with low resolution. Tonight I opened that photo in Painter IX, posterized it and cropped it, and here is the result. Today I came across some more photos of Manchester, New Hampshire. This is from a picture that I took around this time last year. I am planning a series of paintings of the Merrimack River in Manchester, and I am thinking of including some of the old mill buildings, or maybe even views of the river from inside the buildings. You can't see much of the river in this image, but I like it for its complications of patterns: blinds, brick, reflections, and windows. Tonight I rotated and cropped my photo to get the composition, and then posterized the image in Painter IX. Last week I went up to Manchester, New Hampshire, to take pictures of the Merrimack River for a series of paintings I am going to do. The weather was against me; it was cold and rainy, and the sky was a dull gray. But I managed to take over fifty photos to use as reference. Editing the photos gives me a chance to think about how I want to approach the subject matter. 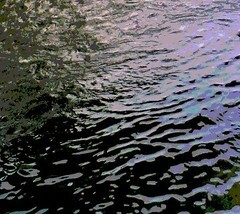 I like the patterns created by the river current, so I cropped a bit of that out of one of the photos. Then I opened the image in Painter IX to posterize it. But I still wanted to add some color to see how the river might look under a colorful sky, so I used a transparent color overlay. Then I cropped the image again to get the composition I wanted. Whether or not I use this image as the basis for a painting, I decided that I like it for its own sake, so I am posting it here. This is a piece of digital art that I created recently using Painter IX on my PC. I wanted to find ways to use the patterns I have been creating from my photos, and to get some practice with Painter's pattern pen which allows you to pick up a pattern and "draw" with it. This composition was created with two patterns from my photos. In the center is the raspberry pattern that I posted a few days ago, but it looks quite different because I used a pastel pattern pen that picks up the shapes in the pattern, but not the color. 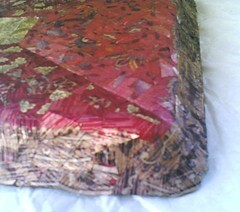 Because I chose a transparent pattern pen, I was able to create an effect that looks a bit like layers of tissue paper. 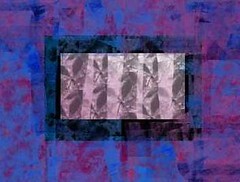 The outer rectangle contains a different pattern, Petunia Duet, which I also created from one of my photos this summer. In this case, the pattern pen I chose was a gradient marker, which applies the shapes in the pattern in various colors taken from the original image. This pattern pen is also transparent, applied over colored "paper," which is actually the digital background. Well, it was good to get some practice with pattern pens, and I learned a lot. As a bonus, I liked the image I created in the process. Early yesterday morning, I went to Red Brick and worked on this project for while. I am making a collaged design on the back of a styrofoam tray; there is already another collage on the front, an image of three roses and a vase. I am using metallic fabric ribbons printed with various designs, with gel medium for the glue. I have been worried about running out of red ribbon, but yesterday I found some additional scraps of bright red, so I was able to bring the red areas almost to the edge of the tray. I tell myself that the pink areas and the bronze-colored sides of the tray will go faster because I won't have to spend time searching for those colors because I have plenty. I want to finish soon because I am starting a big painting project. But hurrying doesn't help. The work is only tedious when I think about time; if I focus on the task itself, the work is completely absorbing. This is how it looked yesterday when it was time for me to stop. To be continued. . . . Sometimes the simplest things are the best: apples in a tree after the rain, honey to dip them in, and hope for a sweet new year. A few years ago on September 11th, I posted the original version of this photo, taken during a visit to New York City in 1988. 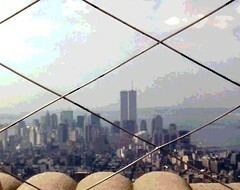 I was taking a tour of the Empire State Building and I took a photo of the New York skyline. Although I have visited New York City many times (especially while I was living in New Jersey), I have surprisingly few pictures of the World Trade Center. So today I decided to posterize my old 1988 photo because it is a nice memory of the New York skyline as it used to be. 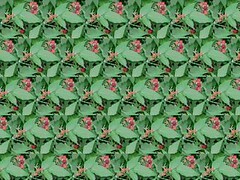 Using the posterized photo of raspberries that I posted yesterday, I created a pattern with Painter IX. I adjusted the size of the image as well as the amount of offset, until the pattern looked the way I wanted it to look. So here another way of looking at the problem of too many raspberries. In this image, there are just enough raspberries! Yesterday I spent time in the yard rescuing a small bush from some overly enthusiastic raspberry plants that were overtaking it. It has to be done or the raspberries would take over everything. But I really hate to do it, not just because the raspberry plants resist and scratch and refuse to cooperate (which they do), but because they really are quite beautiful. 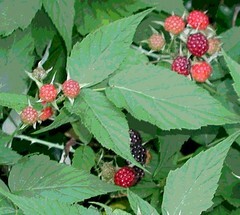 So here is a picture of the sweeter side of raspberries. This image began as a photo taken in June, two years ago. Tonight I cropped this image out of the photograph and then posterized it in Painter IX. I think it will make a nice pattern. To be continued. . . . It is so hot today that it feels like July rather than September. Time for one more summer memory. 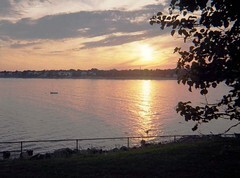 This is a photo of Beverly, MA seen from Lynch Park. I took the photo during an after dinner walk one summer evening. Although I liked the view of the sunset, the contrast was a problem and also there was a rock in the wrong place, throwing off the composition. So I opened the image in Painter IX and fixed the problem with a little cut and paste and some digital pastel. I also adjusted the contrast and increased the saturation just a tiny bit. In just a few months, it will so cold that it will be hard to believe that it is ever hot here in Beverly, but looking at my summer photos will help. Woodmans is a famous Massachusetts eatery where tourists line up to eat seafood (especially clams). But after tourist season, it is also a great place to have a quick meal outdoors, especially if you want to include a dog in your picnic plans. Yesterday, after just such an impromptu picnic, eating corn on the cob at a wooden table behind Woodmans, we discovered their pet walk trail, which is actually a lovely little walk through the marsh grass. I recommend it whether or not you have a dog! I loved this little adventure. I could feel the muddy ground under the grass and could really understand that this was a marsh. 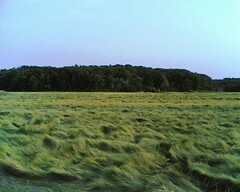 I had never had such a close view of marsh grass before, so I took pictures with my phonecam. This is one of the photos I like best. Tonight I cropped it just a bit to improve the composition. Today I went to the studio at Red Brick and worked on this collage, which is on the back of a styrofoam tray. There is already another collage on the other side, an image of three roses in a vase. 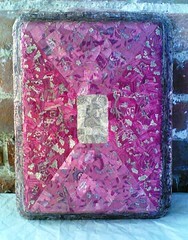 Both collages are made out of fabric ribbons printed with various patterns. Today I had hoped to complete the two red areas, but it was slow going. I concentrated most of my attention on the red pattern because I am worried that I will run out of red ribbon. I also added to the pink areas and to the bronze-colored areas on the sides. Today I felt like I was doing a jigsaw puzzle, looking for the right color, and figuring out where each piece should go. I am usually impatient when I begin to work on this project, but as I relax and give in to the process, I enjoy it and don't want to stop. The trick is to let go of outcome. This is my time to make art, and it doesn't matter if I work quickly or slowly. I only had an hour to work on this today, but when it was time to stop, I could see the progress I had made. This is an image that I have seen and photographed several times in the past few weeks: reflections on the pond at sunset. 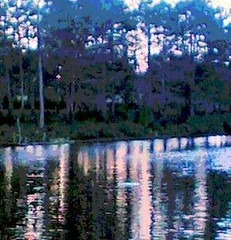 I like the pattern created by the reflections of the trees and pink sky. But most of my photos failed to capture the color of the water and sky, probably because of the brightness of the sunlight. (After all, I was pointing the camera toward the sun.) Tonight I decided to take matters into my own hands. I cropped this image out of one of the photos, monkeyed with the brightness controls a bit, and then opened the image in Painter IX. 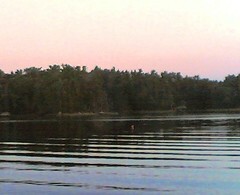 I used a very gentle color overlay to restore the pink colors in the sky and water that the phonecam had lost. Then I posterized the image, changing levels until I got the effect I wanted. 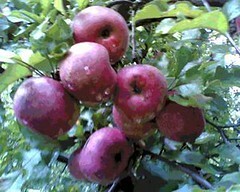 This image began as a photo taken with my cell phone camera during a quick visit to a local farmstand. 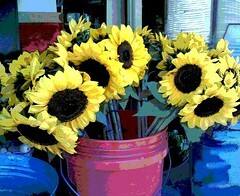 I liked the bunches of sunflowers stuck in a bucket, so I took the picture. But the background was too busy and distracting. So I opened the image in Painter IX. I used some cut and paste to eliminate some signs and labels and marks on the wall. Then I posterized the image. I also began to draw into the image with digital pastel, at first to cover some labels on the bucket. But I decided that I like the effect of drawing into the photograph. So I decided to add some color to the background, and I drew into the area with reds and pinks. I did some more posterizing, and here is the result. Today I went to Red Brick Studios to work on this project. 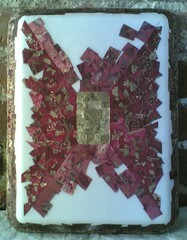 I am making a design on the back of a styrofoam tray, a collage from pieces of ribbon printed with various patterns. 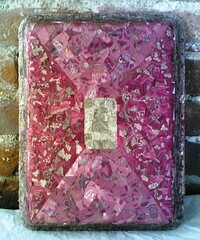 (I already finished the collage on the other side of the tray, three roses in a vase.) Today I worked on the red areas on the right and left sides. I want to finish those areas first because I am afraid of running out of red ribbon before I finish. I am trying to find pieces of ribbon that have only red or red with a bit of gold on them, which is hard to do and slow going. But I could see some progress by the time I needed to pack up and go home. Here's another summer memory. You can always count on daylilies to get you through the summer. They bloom when it is too hot or too dry or too cool or too rainy for other flowers. Because we see them everywhere for most of the summer, sometimes we forget to pay attention. 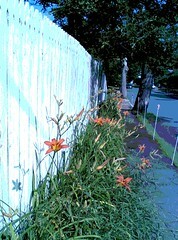 On a summer walk through the neighborhood, I saw these daylilies in front of a fence. 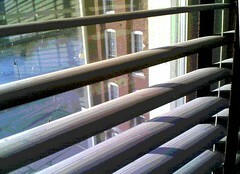 I liked the patterns and the long vertical lines of this view, so I took a picture with my phonecam. Tonight I tried posterizing the image in Painter; the posterizing adds a little drama to the daylilies, and I think they deserve the extra attention. This photo was taken during a recent stop at a local winery (Alfalfa Farms), a short detour after a visit to a crafts show at Topsfield Fair Grounds. The winery is very close to the highway, so close that you can hear the highway noise as you stand in the vineyard. (I have often seen the Alfalfa Farms sign from the highway on the way to New Hampshire.) 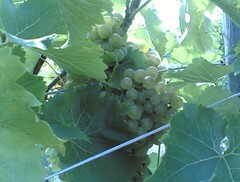 Although the vineyard is very small, just for a moment, you can imagine that you are in France, or Portugal, or California. I took some pictures with my phonecam, and this is my favorite. At the last minute, I noticed a distracting mark on one of the leaves, but I quickly took care of it with Painter's digital pastel. Now all you see are grapes, vineyard, and sunlight.